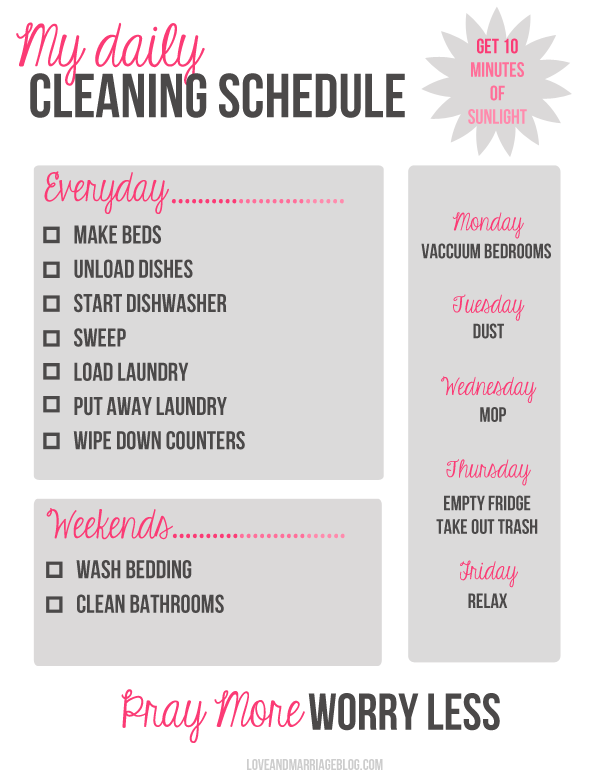 Since I will soon be entering into temporary stay-at-home-mom status, I wanted to try to get some type of daily cleaning schedule in place. It’s amazing how quickly a day can pass and you realize you’ve done nothing but waste an entire day. I do much better if I have things planned out and written down. Checking off boxes makes me feel accomplished at the end of the day. With all the billions of free printables out there I thought for sure I could find one to suit my needs. I didn’t so I made my own! Download your cleaning schedule here. My plan is to put this in a plastic sheet protector and use a dry erase marker to check them off each day. I will also use that to circle what day of the week it is so I remember to do that coordinating chore. I also have my daily reminder to get 10 minutes of sunlight every day. Sounds silly, but you would be surprised how often you can get stuck inside or just go directly from the house to the car. I think it’s important to get direct sunlight every single day and seriously improves my mood. I’m working on one of those home management binders to keep my life in order while I’m at home. Wish me luck! This daily cleaning schedule can be very useful for every homeowner. With the help of this blog , people can make their schedule of daily cleaning. Thank you for this schedule printables! The schedule is exactly what I needed – clear enough and without unnecessary details. I ‘ll keep it every day without worrying to forget something. Greets! 19th would be great for myself. When do you clean the bathroom, its not on your schduele. It is listed for a weekend duty. When do you vacuum the rest of the house? Not sure if doing it all vs some rooms at a time better! I’ll have to throw windrex/glass surfaces in there somewhere but yes! I love it! Probably wth dusting because obviously that would be a good fit. I always try to complicate things by combining everyday cleaning with bi-weekly cleaning and monthly cleaning and so on. It drives me bonkers! I just want it all in one place but… alas, just not possible. This schedule is useful however, will have to change it a bit as we’re only two people in a small 1 bedroom apartment, and both of us work. But I do mainly the cleaning and it can be a bit taxing along with mixing in yoga and working out. But very functional if you have a home and kids living still with you! Great idea! About the need for sunlight each day: Apparently there is great benefit from 30 minutes a day outside in full spectrum light, but you must not have glasses or contact lenses on at the time. Google Dr. John Ott to learn more. I think you forgot vacuuming the rest of the house. All of the newer homes only have carpet in the bedrooms – so that would be something you add to the list . The simplest way to keep our home reliably clean. Thank you. I love that you have start dishwasher on there! I’m always forgetting to start the dryer! Then I go back in the laundry room and the clothes are lying there still wet. Pittsburgh Steelers at Miami Dolphins When Ben Roethlisberger and the Steelers’ offense is on the field this week, there isn’t a position where they don’t enjoy the advantage. I can never understand why people vacuum before they dust, it makes no sense to have the dust going everywhere after you have vacuumed. I use Swiffer dusters and as good as they are, they don’t pick up everything, especially cat hair, and so anything that isn’t trapped in the duster ends up on the carpet. If I vacuum first, then dust the next day, now I would have to vacuum again. No…dust first then vacuum on the same day. Thank you for sharing your organization lists. You have been a Godsend. The more I get done in my declutter and cleaning goal…the better I am feeling. It took your organizational schedules to get me organized! I was feeling pretty overwhelmed! Thanks again! Your de-cluttering schedule was recommended to me. Is it still possible to get this? Love love love love this. It’s going to help me so much. Thank you. Nice but I wish someone would make something like this for people who work. For example I’ve already left for the day by the time the rest of my family wakes up, so no beds are ever made. I need like a single day cleaning checklist.